This advert was in the window of WHSmith in the Metrocentre today. 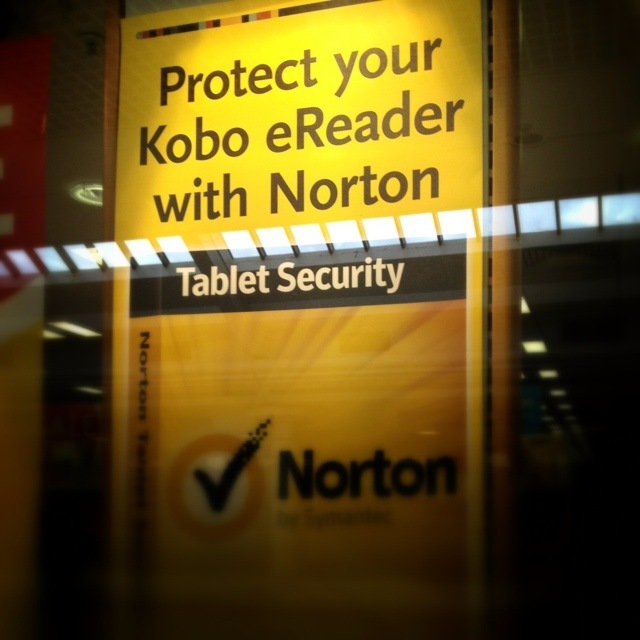 I was amazed that anyone could be promoting software to “protect” an e-reader (protect from what?! ), but also amazed to see that Peter Norton no longer features on the boxes of Norton products. Wikipedia says the latter has been the case since 2001, which surprises me. I wonder, given that Mr Norton is 69 this year, whether it’s a case of marketing ageism? I suspect probably not, I guess pictures of software engineers on products are just not fashionable any more. That said, the fictional Mavis Beacon still beams on the packaging of that software. This 1,616th post was filed under: Photo-a-day 2012, Technology, Norton, Retail.